Portfolio Careers: What, Why, Who? So, this post is part of my new career section on this blog. As I am growing and soon will be leaving college, I want to share what I learn along the way so that hopefully, it will help my audience and fellow soon-to-be college graduates. 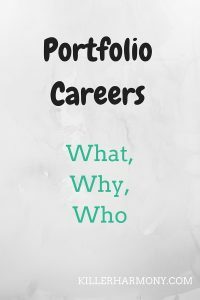 Today, I’m going to tell you about portfolio careers. In a nutshell, a portfolio career allows you to make money doing multiple things. For musicians and other creative people, the need to have multiple streams of income is extremely common. Most people can’t make a full time wage simply performing or writing. You need to use different skill sets to earn a living. Some people might teach part time at a university or in some sort of school setting during the day, have rehearsals for a chamber group in the evenings, and then perform a show or two on the weekends. A freelance blogger might have to (of course) work on their blog, write for paid publications, and maybe do a little bit of blog consulting in order to make enough money to do what they love. I am currently looking at different options for me to pursue in order to run my own blog and online business and get paid for it. I am working on writing posts for websites that will pay, but those publications are obviously going to be selective, so I have yet to be accepted. I am also on Fiverr & UpWork, which are two places to go to find freelance work online. I have not had much luck on there, but I plan to stick with it as long as I can. I also plan on relaunching my Etsy shop at some point in the future, so stay tuned for that. Now, the part about what, why, and who. Portfolio careers are not your typical career path. If you have a portfolio career, you don’t just go to a day job from 9 to 5 and then come home. You will probably be doing a lot of different things and will have a lot of different income streams. That’s okay. If you are a graphic designer, you might have a consulting practice where you help budding graphic designers as well as an online shop where you sell premade or customizable graphics. So, why would anyone want this sort of career? Well, it gives you more flexibility and more variety in your work. You won’t have a monotonous 9-5 job where every day is the same. Each day is different. Each day might result in working with a new client or starting a new project. Portfolio careers often allow you to pursue something (or multiple things) that you are passionate about, because you call the shots. You don’t like change and would rather have a set schedule. This is totally fine, and I completely get not liking change and not wanting to have a new schedule each day. I wouldn’t totally rule out a portfolio career, though, because if you can find multiple income streams doing the same thing, it might just work for you. You want to come home and be done with work. If that’s you, I get it. But you probably should look for more traditional jobs. Portfolio careers often involve working for yourself or working odd hours or just bringing your work home in general. Just be sure you find a job you like so that you aren’t itching to go home as soon as you get to work. You don’t see any job listings that appeal to you. If you can’t find the perfect job, it might be a good idea to create your own. The internet is a great place to find anything you are looking for, including work! A portfolio career will probably work for you; it will be more satisfactory. You’re open to working odd hours and having those hours change. Working different types of jobs as part of your career will probably involve some odd hours or late nights. Your hours might change a lot, at least at the beginning. You need to be flexible. You would prefer to work alone and for yourself. Does the idea of working for “the man” get you down? You should probably start your own business. With the rise in popularity of the internet, self employment is becoming more popular. You can take the sorts of jobs and accept the sorts of clients that you choose, rather than those assigned to you by your boss. Do what you want…within reason. So, those are the big points of portfolio careers. I would love to do a lot of things, and so that is why I am definitely considering a portfolio career for myself. I hope this information helped you and maybe made you think about some different options for your career. Are you (or will you) consider a portfolio career? What would you be doing? Let me know in the comments! Author Hannah HaefelePosted on July 25, 2016 October 28, 2016 Categories Blogging, Career2 Comments on Portfolio Careers: What, Why, Who? If you are in college or will be starting college this fall, you are probably thinking about what things you will need for your dorm. Dorm necessities tend to vary from person to person, but the basics are usually the same. In this post, I am going to tell you about my dorm necessities. I have only lived in a dorm for one year, since I spent my first two years of college at a community college close to home, but my one year of dorm life has taught me a lot. Especially when it comes to what I NEED and what I can live without. You probably won’t have a ton of space for comfy furniture in your dorm, so you want to make your bed as comfortable as possible. Over time, I have come to need at least two pillows to sleep. I decided to take three pillows, though. Two to support my head, and a back up pillow to keep my main pillows from falling off the edge of my bed. I move a lot when I sleep, so I need as many pillows and back up pillows as I can get. I like to drink cold water, so I need a freezer to keep ice in. Yes, there are places in my dorm where I can go get water, but they’re not always so convenient. I ended up on one of the older floors…one of the floors with no fancy filtered water fountain or place with cold water. I need my freezer. Going along with the previous item, I like having water in my room so that I don’t have to walk to the next building over when I’m thirsty. I keep plastic water bottles on hand, but I like having a reusable one and a pitcher, too. I take the reusable bottle to the water fountain, fill up its 40 oz, and then put it in my pitcher in my room. It’s much easier than carrying my pitcher. I know that most dorms may not have the space, but a bedside table is one of my non-negotiables. I like the convenience of setting my phone next to my bed rather than on it, and I like having reading material for late at night. If you don’t use a night stand or something, how do you do it? If you live in a dorm, odds are you will have a key for your room and you will need your student ID to get into the building. I like to keep both of these handy, so I have an ID case with my student ID, drivers license, debit card, and other important things all in one place. Points if you also get a lanyard, because then you can hang it on a hook by your door. You won’t ever forget your keys again. I am actually asking for an upgrade in the form of a smartphone wristlet for my birthday, which is less than a week away. 🙂 That way, I can have a place for my ID, keys, and phone. This isn’t as important as some of the other things on my list, but it’s on here because I do like having it. My campus is fairly small, and the town is not necessarily big enough for me to want to have my car, so a bike is a nice compromise. I first brought my bike down to help with getting from one end of campus to the other in ten minutes. It was necessary, because for some reason, my university put the music building in the complete opposite corn of campus from the marching band practice field. But that is a rant for another day. This is a must if you hate slow internet. I decided to get one after hearing about it in a YouTube video, and I am so glad I got one. At the start of the year, I couldn’t figure out how to connect my laptop to the school’s wifi, so having a direct line to the internet was amazing. It also helps to be able to connect through an Ethernet cord if you need to study or work on a paper at peak times. The more people using wifi = the slower the wifi gets. An Ethernet cord lets you bypass that. This was literally my holy grail this past year. I bought a couple of regular shower caddies, one hard shell, one mesh. They just did not reach my expectations. I wanted something that I could bring into the shower with me but would not get wet or have to sit on the ground. This shower caddy blew me away. It was so convenient. It barely got wet, and it hung over the rack where the shower curtain hang. I’m a fan. I hope these items inspired you or helped you narrow down what you need for your dorm room. As I said at the beginning, everyone is different. You may not need or want everything on this list. I just wanted to share to give you some inspiration if you are out of ideas for dorm stuff. Have you lived in a dorm? What are your dorm necessities? 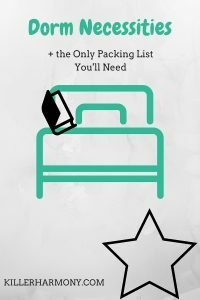 Want my full packing list? I’ll be sending it out THIS Friday, July 22, so subscribe below! I’m currently a senior. That means that I need to start thinking about what to do in a year from now. 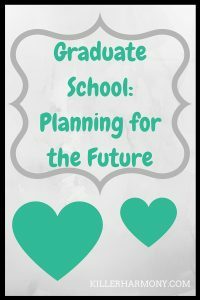 I want to start a series on this blog that will catalog my experiences with planning for the future: deciding on graduate school or to start working, where I want to go, and what I want to do with the rest of my life. This is the first in that series of posts that will be over the next few months of my life. So, what to do when I graduate from college in just a year? I could go into the working world. I could continue my education and earn a graduate degree or some sort of certification. I am looking at a few programs right now, a couple online programs in digital media and one hybrid (part online, part in person) digital media certificate. I have fallen in love with digital media, and it would not be without this blog. The last choice that I could make is to put off graduate school and start working immediately. This is something that, at this point, seems almost easiest. Even though I would rather continue with school, I would be responsible for the cost of it. And while I believe that I would find it more difficult to go back to school the longer that I am out of it, I have to think practically. I would like to get my masters at some point, even if it is not right after my bachelors. I also don’t want to become a “professional student” who is scared of the working world and just stays in school forever. And, student debt scares me, so I would like to keep mine to a minimum; if I am not able to get a graduate assistant-ship, I will probably have to work and save for a little while. Another part of this series will deal with finding a job outside of my major. While I would love to pursue a career in music, it doesn’t seem very realistic. I also know that, unless you luck out, most music jobs come with long hours, little pay, and little to no benefits, like health insurance. I would love to eventually take some performance jobs, but I need to establish a routine and have a decent and regular income first. I have come to love working with different forms of digital media, such as graphic design, social media marketing, and copy writing, so I would love to start a career in this field. Whether I make this blog into a business or I work for another company, I love the digital world. And even if I don’t ever end up pursuing music professionally, I do know that I have no plans of quitting music. It will always be a part of my life. And if I have to get a job, I also do not see myself quitting this blog anytime soon, either. These next few months will involve making a lot of decisions that will affect my life for the foreseeable future and beyond. I hope that this series helps anyone who might be in the same boat as I am, musician or not. Thanks for reading, and let me know if you have any ideas for posts by commenting below or tweeting me! Ah, college. A place that can be full of germs and people to spread those germs. It can be hard to not get sick in college, especially if you live in a dorm. College dorms are the perfect breading ground for germs. You are surrounded by people on all sides, and you have to interact and share so much with those people. Who knows what they do to keep germs at bay, it may be nothing. If you have not read the part one to this post, click here. That’s why it’s your job to try and stay healthy as best as you can, but that may not always be possible. Here’s what you should do when you get sick in college. 1. Rest as much as you can. Resting is one of the two best things you can do for your body when you are sick. (See 2 for the second thing) In college, you probably have a lot of things to do. I understand. Come August, I will be extremely busy with classes, four (yes four) different musical ensembles, preparing for two solo recitals, and working to grow this blog. We all have busy schedules, but when you aren’t feeling your best, anything you do will not be done well. Rest up so that you can get back to your busy life sooner rather than later. 2. Drink all the (clear) liquids. You should already be drinking enough water, but it’s so important when you are sick. If you want to have something besides water, stick to clear liquids and drink something like Sprite or 7-Up. You can get really dehydrated when you are sick, so drink up like your life depends on it, because it kinda does. Assuming that you followed my first tip and are resting, it should be easy to always have water with you. Put a cup or bottle next to your bed. Fill a water bottle if you absolutely have to go somewhere. 3. Stay Home From Classes. Yes, I am giving you permission to skip class, but just this once. The last thing you want to do when you’re sick is have to sit through a lecture that already makes your head spin. You also don’t want to get your classmates sick. Just be sure to send your professors a quick email. You don’t have to (and probably shouldn’t) tell them about how you puked in the dorm bathroom at 2 am. All they need to know is that you are feeling sick and that you have decided to stay home and rest. 4. Go to the Doctor. Your campus should have a student health center for those of you who are not in your hometown. Either make an appointment ASAP or go in during walk in hours. The earlier you go to the doctor, the earlier you can get any necessary antibiotics. I especially recommend this to people who have a less-than-stellar immune system. You need to get better. If you do go during walk in hours, get there as close to when they start as you can. The sooner you get there, the less you will have to wait. When I got sick this past year, I got the the health center about five minutes after walk in started. When I was finished about forty five minutes later, the wait was almost an hour. 5. Go Home, if possible. If you go to school close to where you live, don’t hesitate to go home. Don’t drive yourself, though, get a parent or friend to drive you. Being home will give you a few benefits. First, you are at home, where your parents can take care of you and get you food and water (see 2 above). You can also take your college bed sheets and stuff home to wash so that you won’t continue to spread those germs. I know that I also get much better sleep at home than at school, so if you are like that, go home. Getting good quality sleep is super important. 6. Ask Your Roommate or Friend for Help. If you do not end up going home when you are sick, ask your roommate or a friend to go get you some medicine or other things you may need. If they are a good friend, they will help out. Just be prepared to help them out if they get sick. If you want my list of things to have on hand in case you get sick, subscribe to my newsletter, because I will be sending that out hopefully sometime next week! This is not really a tip for when you are sick, but to prepare yourself for the possibility of getting sick. Make sure you stock up on (affiliate link) common over the counter medications. You never know when you might need some ibuprofen or a decongestant. Being prepared will mean that you can get more rest and spend less time worrying about what you need to get better. You will already have it! Have you been sick in college before? How did you get through it? Do you have any other tips for how to survive being sick in college? In college, it might seem like getting sick is always inevitable. You’re surrounded by tons of people. 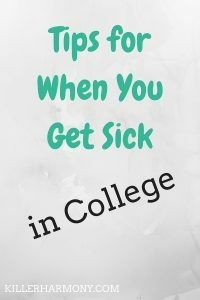 You probably will come down with a cold at some point during your college years, and that’s okay. Today, I’m going to tell you all about how to avoid getting sick in college. I think most of us who have been through college, especially in the dorm, have had our fair share of sickness. I have had it, my friends have been sick. It’s a reality, but you can stay safe. Here are my tips for avoiding the campus bug. 1. Wash Your Hands…a Lot. It may sound simple, but washing your hands is the first line of defense you can set up against germs. It’s also one of the parts of your health that you have complete control over. On a college campus, your classmates won’t always have the best personal hygiene. So take it upon yourself to keep yourself as germ-free as you can. 2. Get Hand Sanitizer And/Or Alcohol Wipes. Whether you have a big bottle on your desk or a small pack of wipes in your backpack, you need one or the other. You can’t always get to a sink to wash your hands, so having hand sanitizer available is a good idea. My friend always had a small bottle in her purse and would share with everyone after leaving the cafeteria. You can never be too safe. Vitamin C is not guaranteed to help you not get sick, but it never hurts. You never know when it might come in handy. I love the (affiliate link) lemon lime flavor of Emergen-C, but any way you like it works, too. It also doesn’t hurt to just take vitamins in general. If done right, it can be great for your health. Water has many benefits, and I can get behind all of them. First off, water is free, except for bottled water. When you are out at a restaurant, save yourself a couple of bucks and get water instead of soda. Water also benefits your health. It can help with your skin, and it can also help flush out toxins that could lead to getting sick. Just drink water. Your body will thank you for it. Especially the meningitis vaccine. Getting vaccinated against diseases like the flu is a simple way to prevent getting sick. It’s not always a guaranteed block from illness; I still got the flu last year after getting the vaccine. Getting vaccinated is a smart thing to do, and it is usually a requirement. At my university, you have to get the meningitis shot if you plan to live on campus. You can file for an exemption at some places for religious or health reasons (the vaccine could get you sick, though it’s not likely). I suggest you don’t exempt yourself and that you get the vaccine. Not only is it smart, but better safe than sorry. Also, my university has a clause that reserves the right to kick someone out of the dorm if there is a meningitis outbreak. 6. Be the Weirdo Germ Freak. You probably scoff when you see someone use a paper towel to open the bathroom door, but is it really that weird? People don’t always wash their hands (see 1 above), so you can never play it too safe when leaving the restroom. So go ahead. Be that weirdo who checks for every little thing. Use your sleeve to open doors. Carry hand sanitizer with you everywhere. It will be worth it when your friends get sick and you don’t. College is one of the best parts of growing up, and it might seem like getting sick is inevitable. You are, after all, living in close quarters with dozens if not hundreds of other people. Just follow these tips to avoid getting sick in college, or at least to avoid serious illness, like the flu. I can’t guarantee you won’t get something like the cold at least once in college. 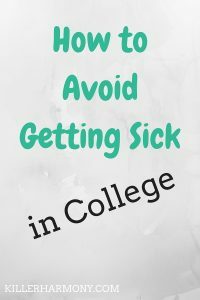 Stay tuned for a part two to this post: what to do if you do get sick in college.